Losing one or more teeth doesn’t have to mean the end of the world for your beautiful and functioning smile. These days, options in restorative dentistry can provide a life-like and long-lasting solution for any number of missing teeth. Dental implants are the premier method of replacing missing teeth — but is this option right for you? Keep reading to learn these top 4 things to know about dental implants from your dentist in Boston. Patients who have been missing teeth for many years or who have had severe periodontal disease may have lost significant bone tissue as a result. This insufficient bone structure can increase the risk of dental implant failure. Bone grafting procedures can help, but may not be possible or sufficient for some patients. Your dentist will evaluate your oral and overall health to determine your candidacy for dental implants. There is no one-size-fits-all in dentistry, and the same is true when it comes to dental implant solutions. There are a variety of options available in tooth replacement. The one that is right for you depends on the extent of the tooth loss, where in the jaw the missing teeth are located, your budget, and other factors. Dental implant procedures are typically completed over the course of two major phases: implant placement and implant restoration. The first procedure is a surgical procedure, which can make some patients worried that it will hurt or at the very least be uncomfortable. But, thanks to modern anesthesia, sedation, and state-of-the-art techniques, there is nothing to fear from a dental implant procedure. 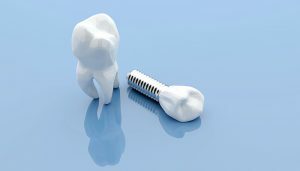 One of the things to consider with dental implants is that the traditional method may take several months to complete. You won’t be without teeth during this time, though — your dentist in Boston can set you up with a temporary prosthesis to help you eat, speak, and smile with ease. Although most implant treatments take several months to complete one option can help you achieve a fully-functional implant-supported denture in less than 24 hours. All-on-4 or Teeth-In-a-Day is a great choice for patients who have lost all their teeth in the upper or lower jaw. There you have it — the 4 things you need to know about dental implants. Want to discuss this option for your smile? Don’t hesitate to get in touch with your dentist to talk about dental implants in Boston this month. You deserve the very best in tooth replacement! Kraft & Schrott Dental Associates offer quality dental implant services for patients who have lost one or more teeth. To learn more about this option or to discuss any other general, preventive, restorative, or cosmetic dentistry treatment, you are invited to contact the office by phone at 617-977-5266.